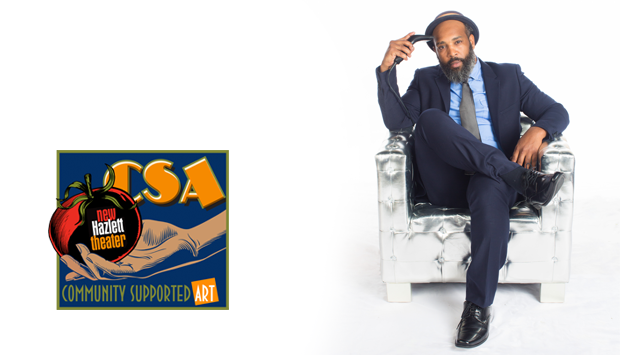 Tameka Cage Conley, PhD sat down with Ricardo Iamuuri to talk about his upcoming CSA Performance Series production, A BRAND NEW WORLD: kill the artist. When I first read the title of your project, “A Brand New World: kill the artist,” I was immediately intrigued. Of course I thought about metaphor and also about identity and the current cultural climate in which we live. How did this title–and the project itself–communicate the artist you are now and your journey? The title A BRAND NEW WORLD: kill the artist is fairly of a resignation letter. The title was born from a culmination of personal, artistic expressions, which hinted upon the content the title holds. First, it’s a take on Aldous Huxley’s dystopian work Brave New World. The world I refer to, “The Cool World,” could be considered dystopian or it could only refer to what is. I’ll leave that verdict up to the viewing audience. The title is the only commonality with Mr. Huxley’s work. Beyond that, this piece is not an adaptation. “Kill The Artist” represents a personal struggle of interests. This inner conflict is between the wildfire man and the conforming artist. “Kill The Artist” adds an urgency that something drastic needs to occur now in order to resolve this all too familiar friction. Can you talk about the revolutionary or resistance aspect of your work, particularly this project? I do not think this composition to be revolutionary. Nor do I hold it to be an anthem of resistance. A BRAND NEW WORLD: kill the artist is a reaction and a product. A response to other wares being made in the marketplace. I think we are bound to react. All life on this planet is inter-reactionary. This opus is no different. If it so happens to animate a movement toward social transformation, I would be surprised. I do feel it manages a power to make one reconsider. To rethink. To consider another look and listen. I’ve heard you mention this aspect of “consumerism” in the art world. What role does consumption play in art and art-making? Hello, my name is Ricardo Robinson and I am a consumer. I’m saying that to say this: I am very mindful of my consumerism. Our civilization is a consumer culture. Everywhere I turn I am besieged by advertisements baiting one to buy into something. This reality is so all-consuming it pervades our daily moments. Even our everyday exchanges lean more toward transactions instead of priceless connection. We have become walking billboards, automated vending machines, ad agencies, speaking in slogans and pitching our dreams to the next purchaser. This consumerism makes a business out of everything. Birth. Death. Love. Hate. Everything! Nothing appears to be without a price. Thus, I don’t know what to do about this way of living but hold up my art and keep stating… It doesn’t have to be this way. As artists, what should our boundary be in terms of our relationship to earning money and money in general? I am not against being compensated for one’s labor. I believe the boundary everyone should set is a boundary that declares your self-worth. It’s very hard to fight for a living income when there’s so much division and desperation amongst the working class. The cultural motto seems to be, how do I get more for less? I hope this mentality dies someday soon, and everyone chooses quality before quantity. Until then, the power structure of oppression will exist and exploitation and pitting the working class against themselves will continue to be the easiest job in the world. What are some of your influences for “A Brand New World: kill the artist” and how is the Hazlett Theater, in terms of space and design, ideal for this project? There are too many influences to mention here. But I imagine I can point to fashion playing a significant role in the making of this piece. I’m not talking of the kind of fashion we usually associate with dress code and style. I’m regarding fashion as the general cover up. The fashion of freedom. The fashion of hope and change. The fashion of fire and protest. The fashion of terror and the fashion of passion. The fashion I speak of is the commercialization and the commodification of life itself–reality packaged in cellophane and sold back to the masses, watered down and chilled off. The New Hazlett Theater is a prime space to start out this artistic campaign. The environment is calming, controlled. So it’s going to be very interesting attempting to contain a piece meant to be wild. I feel excited because your show is so dynamic: from sound, to drama, to music–it has it all. You are pushing boundaries as an artist even as you push us to think about art in our time and all it might signify. How do you confront such boldness on stage and how do you prepare for it? I’m flattered by your warm remarks. Thank you. I suppose it’s odd how introspective I become before a show. But maybe I’m always this way. My apprehension of this process is…creation is meditative, and destruction is celebrative. When I’m on stage I am aware of the entertainment factor. This awareness feels like a sort of prison. So, by the conclusion of the piece if I still see the imagined bars of entertainment then I played it safe and simply performed for the people. On the other hand, if by the end of the piece I see no bars, I lost myself in the work and discovered a bit of freedom. What role does social justice and critical consciousness play in your work and in what ways has the time and residency of this Fellowship enabled you to delve deeper into those ideals? A BRAND NEW WORLD: kill the artist could be comprehended as a social justice piece. But even that phrase is in question in this composition. Social justice is a business—a commercial enterprise which provides a service and falls in line like the rest. In this piece I am more focused on the intention of reality, not the fashion of it. I believe that’s a large reason why sound art and noise play a major role in the piece. There’s a rawness and a fleeting truth in every sound uttered before it becomes manipulated and twisted into some kind of propaganda. I’m sure the content of the composition will be related to social justice and critical consciousness. That’s perfectly fine by me. Perhaps by the end of the show a new language will be born. What is your biggest dream for the show? My biggest dream for the show? Well, I think the show is a dream. And the human action of sharing it feels big enough for me. What role does gender, race, ethnicity, and class play in your work, both in “A Brand New World: kill the artist” and in general? In A BRAND NEW WORLD: kill the artist all of those hot issues are indeed hot commodities. When the audience is walking away from the theater after the show and driving or walking home or taking the bus, what do you want them to think and feel? What do you want to leave with them and what do you, as performance artist, want to walk away with? It would be nice to assume all who view the show leave thinking and feeling something. What I’m saying is, I’m not interested in amusing anyone. After it’s all said and done, I would like to walk away with gratitude and know that I did not compromise the integrity of the composition for the sake of praise or validation.